Bouder Mechanical Service Inc. are very proud to be family owned and operated since 1981. Our strong family values give you, the customer satisfaction and time you deserve. There is no middle man or automotive answering machine on the other line. We work directly with you on listening to your needs and providing the best solution possible. On Installation projects, large companies involve 10-15 employees to complete a project. We accomplish the same project with half the manpower. Our training and expertise in the material handling industry has been growing over 30 years. Trusted by the top drug retail/manufactures, food industry and more. Read our clients feedback. Whether it’s from consulting, installation, service and repair. 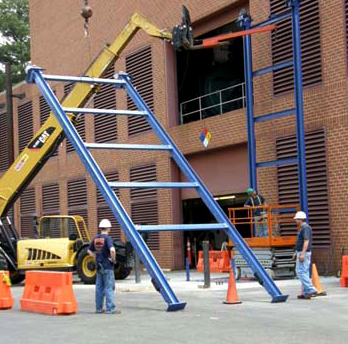 We provide a wide variety of services to fit your needs in the material handling industry. Specializing in Freight Lift installation, repair, services and codes for the state of PA. We also offer installation and repair on Pallet Racking, Rack Repair, Lift Tables, Wire Enclosures, Mezzanines and Conveyor Systems. Contact Us for more information or call (717) 587-7637 for a free quote today.